Checkin’ back on my favorite climate observation sites from last year. The ocean heat content increased from ~17 to ~18 (1022 Joules). They had to extend the vertical axis from 20 to 25 to accommodate the expected rise until 2020. 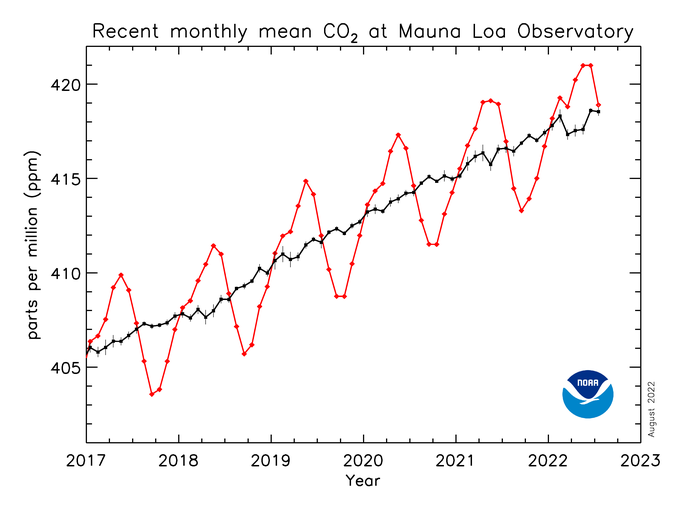 Sure enough CO2 broke the 400 ppm ceiling (as I predicted [I admit there wasn’t much magic in that]). Note that they also had to extend the vertical axis from 400 to 405. Arctic sea ice: about as low as last year. As I suspected last year, 2014 was a record warm year in terms of global average surface temperatures.